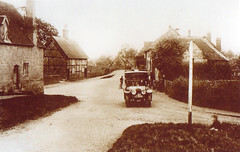 Close to the centre of Stoneleigh Village lies a picturesque, sandstone building. It is The Dame Alice Leigh’s Almshouse and currently it is home to two men and nine women. 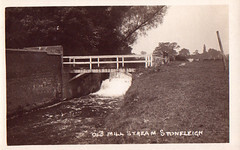 It was established for the dwelling and habitation of five poor men and five poor women of the parish of Stoneleigh, who are to be appointed from among the oldest and most infirm of the parish. 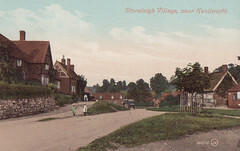 Two wardens of the parish church of Stoneleigh were appointed to administer the Almshouse. The wardens were to be paid 6 shillings & 8 pence each per year for their pains, to provide preachers to preach sermons each quarter, and to see that the poor folks go to church on Saturdays, Sundays and holidays. The vicar was also paid 6 shillings & 8 pence for each sermon. Today the Almshouse is administered by seven Trustees and a Clerk. The Trustees, which include the vicar and a church warden no longer receive the 6 shillings & 8 pence. The Almshouse has ten delightful residences and has undergone substantial refurbishment. All the period leaded windows have been repaired and or replaced, secondary glazing has been installed, new guttering and drainage has been installed as well as substantial stonework repairs. The residents of the Almshouse enjoy spacious communal gardens which also contain a large, useful storage building with dedicated space for each residence. The Dame Alice Leigh Charity provides and maintains the gardens and buildings. Also, all domestic appliances are provided together with carpets, storage heaters, phone line, tv point etc.